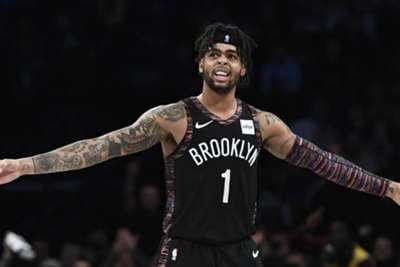 The Nets have been playing superbly and they extended their hot streak in Brooklyn with a big 115-110 win over the Los Angeles Lakers. Brooklyn have now won six straight games, and they have beaten the Philadelphia 76ers and Toronto Raptors during the successful stretch. Not even LeBron James' best efforts were enough to stop the Nets from taking home the victory on Tuesday. D'Angelo Russell led the Nets to the win. The fourth-year guard poured in a team-leading 22 points and 13 assists for the Nets. Joe Harris was right behind Russell with 19 points, nine of which came from three-point range. Los Angeles have now lost three of their last four games. Meanwhile, Brooklyn are on a roll. Larry Nance Jr. had 15 points and 16 rebounds in the Cavaliers' 92-91 victory over the Pacers, which ended Indiana's seven-game winning streak. Bradley Beal scored 29 points on 11-of-17 shooting and grabbed 10 boards in the Wizards' 118-110 loss to the Hawks. Josh Hart scored six points on two-of-10 shooting in the Lakers' loss to the Nets. David Nwaba was held scoreless on 0-of-five shooting in the Cavaliers' win over the Pacers. Mason Plumlee showcased his ball handling skills by going coast to coast for a lefty finish just before the half-time buzzer. Jarrett Allen's relentless rim protection led to a denial of a James slam dunk attempt. Oklahoma City (19-10) and Sacramento (16-14) each have one of the fastest players in the NBA. Russell Westbrook has been exploding towards the rim for years now while De'Aaron Fox is improving at an impressive rate. The Thunder are third in the Western Conference while the Kings are in ninth.